Helps eliminate odor at the source. 48 hours of protection. Powerful protection that provides long-lasting freshness. Goes on clear and stays clear, leaving no white marks on clothing or skin. 3X Triple Freshness Protection: active odor blockers, transparent dry shield, all-day scent technology. Dries in seconds after application Gillette Clear Gel Cool Wave.TOUGH PROTECTION FOR ACTIVE BODIES Give everything. Smell nothing. GOES ON CLEAR. STAYS CLEAR. No white marks on clothing or skin 3X TRIPLE PROTECTION Odor blockers + clear dry shield + all-day scent Don't mask odor, neutralize it. Gillette delivers powerful, long-lasting odor protection in a variety of light, crisp scents to keep you feeling fresh and clean all day. 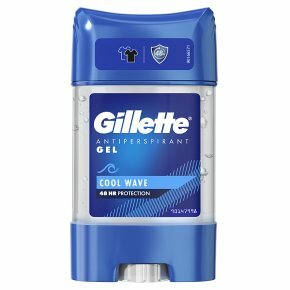 Gillette Clear Gel Cool Wave goes on clear and stays clear to protect against odor and sweat without the white marks other deodorants can leave behind. Clear Gel gives you 3X Triple Freshness Protection that dries in seconds after application. The Cool Wave scent is clean and refreshing. Caution: Do not apply to irritated or damaged skin. If rash develops, discontinue use. Keep out of the reach of children.